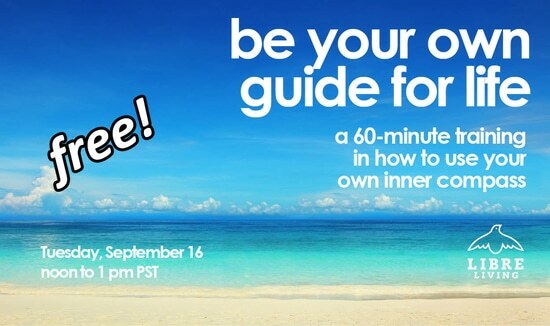 A 60-minute training in how to to use your own inner compass. Do you want to be able to figure out the best route for you, no matter what anyone else says? Do you want to learn how to trust your gut? Are there changes happening in your life or a decision to be made that you want help with? It’s complimentary. Gratis. Just for you. So far, I’ve trained over 1073 people to use this compass to be their own guide for life. On this call, we’ll start with an explanation of the different parts of our selves that can either help or hinder us when we want to make a choice, help you understand which part of yourself you’re listening to most of the time, and then take you through a process to create your own compass so can always hear from your wisest self. There will be time for questions on the call. your curiosity, your questions, and a pen and paper. “You’re a true teacher…You’re devoted, engaged in listening–really listening, and grounded in your own experience.” – Danielle LaPorte, creator of The Fire Starter Sessions, Desire Map and more. Ready to become your own guide for life? Register here. The call info will be emailed to you right away. People who want to do what’s right and best for them, not what everyone else thinks they should do. People who are feeling stressed or anxious more than they feel strong, certain and confident. People who want more joy in their life–every day. If you can’t be on the call, no worries, we’ll email you a recording. The Be Your Own Guide for Life worksheet.